Fixed a couple of items relating to the handling out-of-date plugins. Fixed an issue with the Site Setup sheet not binding to the correct document. Cruftless links are now correctly tidied. Added the ability to drag in multiple files to the resources area. Fixed an issue with views not updating when removing a resource from the project. Re-worked Theme Consolidation to respect the order in which stylesheets appear in a document (respecting the order of variations vs main stylesheet etc). Added an Option-Click feature on the ‘Copy Resource URL’ button to automatically generate a &#xre;source% macro to the file. Fixed an issue that prevented links to Resources, when made via the Add Link sheet, working in RW’s Preview mode. Fixed a crash relating to the Help buttons in the Site Setup sheets. Fixed consolidation of media-query stylesheets. Fixed an issue with the omission of Alt attributes on images. Fixed an issue that prevented users inserting custom snippets for inline styling into the Media Inspector. 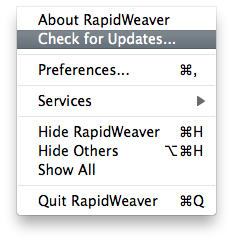 Fixed an issue that would cause RapidWeaver to crash after registration on some systems. Fixed an issue that would cause a number of error messages to appear with placeholder strings. Fixed an issue with relative links not working in plugin subpages (such as Blog archives etc). Fixed Theme Consolidation to work in Photo Album subpages (individual album pages). Added a 16x16 application icon. Fixed a number of Resources issues to prevent the dragging in of bundles (folders with extensions). Fixed an issue that prevented the &#xre;source% macro from working in the Page Prefix field. Blocked the BBLauncher plugin from being loaded, due to widespread reports of it causing issues with RW5. Numerous other small tweaks and enhancements.